The Nutcracker is a classic ballet sure to put you in the mood for holiday lights and, of course, sweet Christmas treats. Watch as Clara takes her journey through the Kingdom of Sweets where dolls come to life. See snowflakes prance, gingerbread come to life and dewdrops dance across the stage. And you surely won’t want to miss the enchanting Sugar Plum Fairy. Performances will take place tenatively December 11-14, 2014, at the Bevill Business Center on the campus of Bevill State Community College - Hamilton. Tickets are $10 for adults and $7 for children ages 3-9. Special school group rates apply for December 11 & 14(school-age only) matinee performances. School teachers or administrators should contact the number listed below to purchase group tickets for the school age only matinees. Public nightly performances begin at 7 p.m. on Thursday, December 11, Friday, December 12, and Saturday, December 13. There will be one public daytime matinee at 2 p.m. on Sunday, December 14. School groups please contact us immediately to secure your seating. 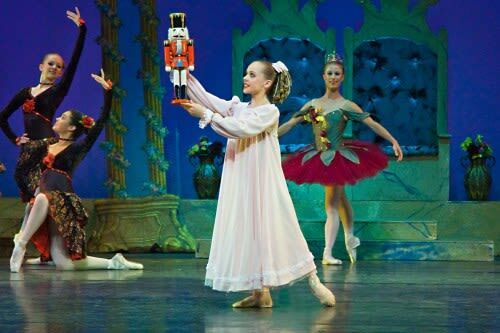 Contacts for The Nutcracker: Email nutcracker@northwestalabamaarts.org, or telephone: the Nutcracker Production Office at (205) 921-0509.